Meet your new go-to summer dessert. This cold little cup of heaven is already my favorite thing about summer. Although, when winter rolls around, I will add warm mulling spices and keep eating this. Icy, boozy desserts suit me well, no matter the time of year. I’d be lying if I didn’t tell you how frequently I enjoyed a champagne sundae. Is every day at 5:00 too often? 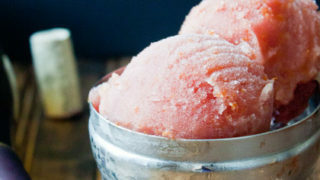 This recipe for sangria sorbet makes 2 cups of sorbet, but you can easily double it. Just make sure your ice cream maker can handle the volume. I feel like I should warn you about the addictive properties of this sangria. You’ve been warned. Now, go make it and enjoy it on a hot day! Churn in your ice cream maker according to the manufacturer's direction. Scrape the churned sorbet into a dish, cover and place in the freezer for a few hours to firm up. This sounds lovely – so refreshing but with a boozy kick. The perfect dessert for a summer day. Beautiful picture! Great way to combine a cocktail and dessert. I will definitely be trying this soon. What?! This looks delightfully refreshing. So perfect for summer. What an awesome idea!! This sounds so good! Plus, I love that pretty color! This looks like summer in a scoop! I’d be tempted to add a few spices too, but I imagine simple is utterly delicious too. Oh yea, this here is right up my alley.. and you added peach moonshine…Brilliant honey..just brilliant! Every day at 5 o’clock is definitely not too often! This looks like perfection. Aaaaand, there’s the kicker. This is why I officially NEED an ice cream maker! Wow. I love that picture too! Very clever to put the sorbet in the martini shaker top or a bowl that very strongly resembles that. What a fantastic idea! 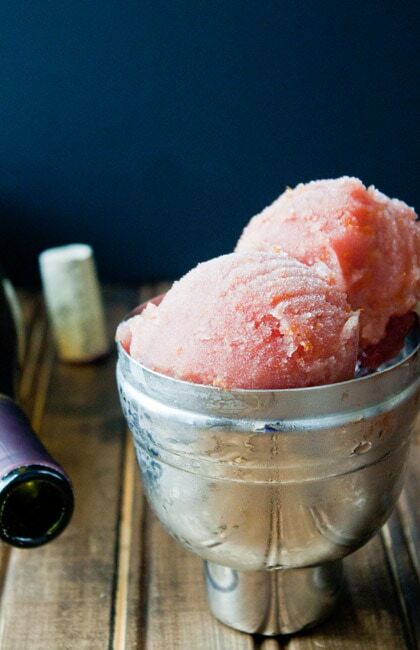 I’m a huge Sangria lover so I’m sure I would devour this sorbet! I am OBSESSED with sorbets right now – they’re so easy to whip together and throw in the ice cream maker!!! Nice to meet ya, summer dessert! I’m going to need a constant supply of this sorbet, it’s been so hoooooot here! I shouldn’t complain, because in your neck of the woods, it’s probably a good 10 degrees hotter. Delicious dessert as always, lady! i have been seeing so many sorbet and ice cream recipes and this is making me want to buy an ice cream maker. This looks like such a fun summer treat! Yum! What a fabulous summer dessert! Love the photo too! Dang! This sounds amazing. I love a boozy dessert! P.S. your home state of Texas treated me very well! Holy eats, I could have stayed for another week eating my way around the city. Oh, girl…you AMAZE me! This is so my thang. Really, pure genius. I also love your impromptu food styling and photography here. So clever to use the top of a cocktail shaker for a cocktail “ice” recipe! No doubt I am making this soon as I venture into ice cream mode. LOVE! Love this idea, Christina! What a fun thing to have as a little 5pm cocktail hour/sweet treat. Perfect for summer. Well hello there little sorbet!!! This sounds wonderful! What pretty shots! And I could use a scoop or 2 of this sorbet. What a beautiful and lovely dessert! If only I could drink! I’ll be saving this recipe for post-baby. I can’t wait. This looks incredibly refreshing. Just perfect for a warm summer day. THIS IS SO HAPPENING. I have a love affair with sangria. And now it’s dessert, too! DANG. You’re my favorite. This is awesome! It reminds me of something I saw in the Food Network magazine this month — sangria floats, which basically amounted to dropping scoops of sorbet into red wine. :) Love the idea of sangria flavored sorbet though! I want brain freeze SO bad right now. Oh yum! This sounds like an absolutely wonderful and refreshing summer treat. I love it! Sangria sorbet?! Be still my beating heart. I’ve been craving sangria all week long and now you’ve gone and dropped this in my lap! Such a great idea! Cool and refreshing. Perfect. I’m already OBSESSED with sangria and now you’ve gone and turned it into a summery dessert. You, girl, read my mind. Never tried sangria – but this looks fantastic, might try and whip something up! So pretty and so refreshing!! I am currently OBSESSED with sangria, so this sorbet is just… calling me. I want 3 bowls right now!!! This sounds heavenly! I think I’ll make this for my guests for the 4th!